It's been snowing all morning. On the way in this morning, the pear trees' white blossoms which have looked so cottony-white all week suddenly looked green & dull against all this. Last night was all cold rain, sleet & wind, and thanking God for indoor heat & hot water. Years ago, I suffered a HUGE panic attack at work. I could tell you how it was triggered (and no doubt you'd want the address of the customer responsible so you could track him down & exact some sort of sweet revenge for me), but the reality is that a true panic attack is a reaction to a lot of adrenaline flooding your system, and it scares you, and that's the real trigger. I managed to get home - sick, sick, sick & hyperventilating so badly that I couldn't feel anything from my knees down, terrified I would faint. It took an hour or so before I managed to get myself from the floor next to the bed (where I'd stayed, thinking that if I fainted, I wouldn't fall anywhere) onto the bed. By then, a huge thunderstorm had blown in, and I was just unable to get up & close the window over the bench you see in this drawing. But that was really okay, because I like thunderstorms - I always feel very safe & protected (I owe this feeling to my mother, who taught me that no self-respecting burglar would be on the job during a storm). At that time Maggie the cat, a.k.a. 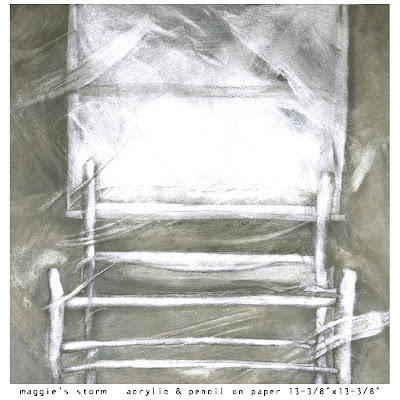 Miss Magnolia, Maggie Pie, Magpie, Maggie Doodle, and the Magster, also loved storms (a freak hailstorm changed her mind a couple of years later). She hopped onto the bench as it grew darker outside, and let the wind & rain blow across her, facing the lightning & thunder as if she controlled it. It seemed to me that she did. I laid on the bed, and just watched her, and eventually stopped thinking, thinking, thinking, worrying, agonizing. I just watched Maggie meditate on the storm. And so I have this drawing, not quite a documentation of the event (after all, you'd've really had to've been there), but something of a talisman. A reminder of the day Maggie taught me to just be. Deb, your blog is....so wonderful. I love your art and I really love the way you write. I'll be a regular visitor. Your blog is a hit! You really are a great writer! I grew up with a whole different view...no..
Rhonda - Thanks for the hippy beads thrown my way! I've had a disheartening day (I feel a new blog coming on!) & your comments really help! Ditto Anonyomous! Is that you Christy? I'm thinking so, and, well, you know how much your support has meant! Thanks!!! It is WONDERFUL. I have not yet been able to scrutinize every aspect of the blog, but I will. Lily looks just like my kitty, Bianca. They could be twins. I love the art, but I knew I would. While we both know that I am not particularly artistic, i wanted to share an anecdote with you. Tuesday I spent the entire day in the Wichita County Jail....not as an inmate but in a forensic context. My flight out of Wichita Falls was 40 min. delayed. Then in Dallas my flight to Tyler was delayed by hours. I just wanted to come home. The flight to Longview which had been delayed since 3:00 PM in the afternoon was canceled and the folks were going to have to stay in Dallas in a hotel. There was a woman near the end of the line with her very young son (2.5-3.0 y/o? )who was tired of waiting. I recalled what it was like when my flight from Detroit to Canada was canceled last summer and I had nothing. Suddenly, I went up to the mother and told her I was a Porfessor of Psychology and a hterapist and I would be happy to sit with her child while she negotiated the flight changes. So he and I sat down on the floor of DFW. I gave him paper. I gave him colored pens in my purse....all teachers carry many pens......and I spent the next half hour with him talking while he drew and drew and drew. He made art and we made a connection. Congratulations to you dear, and now DARING Debra. It is a pleasure to witness your evolution. (Yes for those who do not know me, it is my real name). Dr. Love! The song I told you about was BROTHER Love's Traveling Salvation Show. So you are really kind of SISTER Love's Traveling Salvation Show! What a great story. Thanks so much for EVERYTHING!